Google has been particularly enigmatic about how, or even if, its rankings are influenced by social media. But the experience of industry professionals has been universal—highly engaged content has much greater SEO value than do less popular pages. And that makes sense. Google’s algorithm is designed—and is constantly being tweaked—to find and rank high-quality, useful content for each search query. To do so, it needs a way to measure the value of sites. Social signals are a helpful factor in making that determination because they represent independent assessments of a page’s content. You’re not going to like a piece of content on Facebook or share a link to it if you don’t think it’s worth reading, right? And you’re not going to spend your work break watching videos that aren’t, at the very least, amusing. Social media engagement essentially provides Google with external validation of a page’s value. This means that social media marketing and search engine optimization work in tandem; what works well for one works for the other. 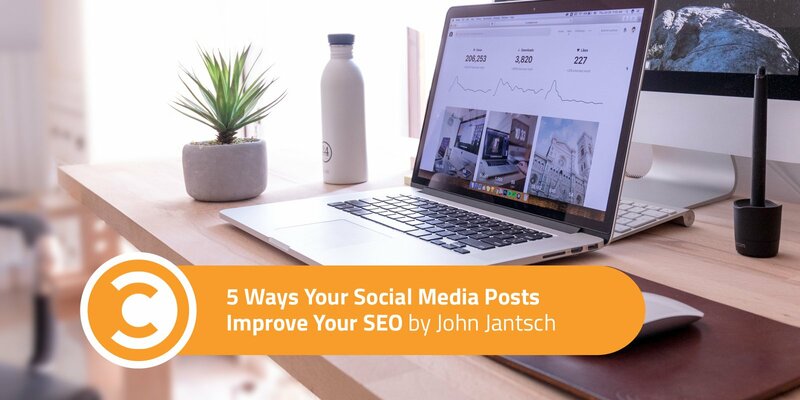 Here are five ways to ensure your social media posting helps your SEO. The internet is a crowded place. To stand out, you need to build a strong, authentic, and engaged brand presence. This is done by strategically publishing optimized content on your social media pages based on a content calendar. Your fans should be able to recognize you instantly as the author of a piece of content because of your design, ethos, and tone. All your content should include an on-brand message to keep it relevant and cohesive. You will get searched more often and increase awareness of your business organically, which is so much more valuable than any advertising. The total number of followers of, and connections to, your social media profiles has a direct and significant influence on your rankings. The more, the merrier. But before you consider paying a shady SEO company to boost your follower count, take note that quality matters. Real followers will engage with your content, and fake followers won’t—and engagement is the key. If you want to build a community, you have to start by thinking of yourself as a leader. All of your social media profiles should be places where your ideal followers want to spend time. Putting out high-quality content is crucial, but then you need to engage. Identify key people in your niche, and follow them to get follows back. Offer incentives, such as a free download or entry into a giveaway in exchange for Facebook or Twitter follows. Get conversations started. The entire purpose or goal of a social network is sharing. Likes, comments, and shares are the most significant action for SEO. The more your community shares your content, the more opportunity for SEO visibility. And shared social media posts can end up in all kinds of places beyond social media: blog posts, articles, slideshow presentations, ebooks, etc. Make it easy for people to engage with your content. Ask provocative questions to encourage discussion. Use hashtags to include your content in a larger conversation. Format tweets so they’re easy to retweet, and respond to all comments on your content. Social media platforms are searchable, just like search engines, so you need a social SEO strategy to help people search for and discover your content. Do your keyword research, plan out your content accordingly, and include the right keywords in your headings, posts, and hashtags. And don’t forget to optimize your profiles the same way you’ve optimized your website—with SEO keywords in summaries, links, biographies, captions, and in the text itself. When it comes to search, keywords are the stepping stones that guide people to your high-quality website content. A Facebook or Twitter user may stumble upon your content because of them and like it, share it, or even become a follower. The social media world is constantly expanding. If you’re limiting your engagement with just one or two platforms, you’re missing out on major opportunities to get your content before different audiences. People on Snapchat are not necessarily checking out YouTube, and Instagram users may not regularly visit Facebook. As with investment portfolios, it’s always best to diversify your holdings to ensure you get a high social media ROI. Successful social media posting and strong SEO strategy operate by the same rules: Provide smart, concise, and valuable content, watch your audience, and engage. By seeking alignment with your followers, you will become known and trusted as a leading expert in the field. They will begin to look out for your content and share it. Remember: That influence snowballs with each new high-quality piece of content you publish.